Actress Namitha joined the AIADMK in the presence Tamil Nadu Chief Minister J Jayalalithaa in Trichy on Saturday. There were rumors from several months that Namitha is keen on joining a political party and is looking for right time. 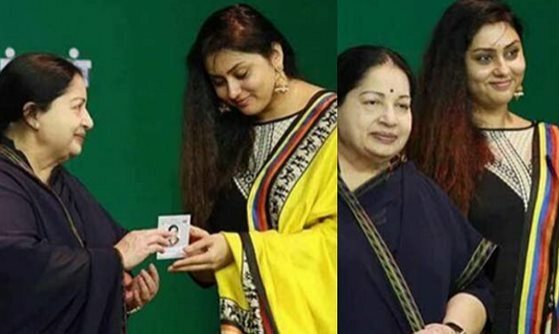 Namitha joined AIADMK party on Saturday and Jayalalitha personally welcomed her with membership. Earlier, she wrote a letter to ADMK Chief J. Jayalalithaa expressing her interest in joining the party. At the Trichy campaign, Namitha was given her official id card as a party member. It is still unclear what role the actress will play, however, we are sure that Namitha is likely to boost the campaign mood. Namitha is one of the most influential heroines in Tamil and she enjoyed a vast fan base. Fans built Temples for her and only Khushboo before her. It was always a huge gala whenever a film of Namitha released in Tamil. The plump actress slowed down recently for change in audience choices of films, but her political career is sure to have a good run given her everlasting fanbase and craze in Tamil state. Predicting her political mileage, AIADMK chief Jayalalitha grabbed her into the party and Namitha is expected to be seen in interesting and crucial posts if Amma's party wins again.